Free Delivery is fast by courier or Australia Post anywhere in Australia. Delivery time estimates are here. Save up to 20% extra with our coffee bean subscription options and ensure you never run out of your favorite coffee beans, or take a look at our Instant Chai Latte. New to Bay Beans or unsure where to start? Try our Variety Pack or learn about the difference between pre-ground versus whole beans. A generous 30% wholesale coffee bean discount is available for orders of 10kg or more. This is our most popular coffee bean and a personal favorite of James'. A very popular choice of cafe's and corporate wholesale customers. Excellent value with superb quality. A Guatemula based coffee bean. A strong coffee with refined acidity, subtle cocoa texture, gentle spice flavours and a sweet aftertaste. An award winning coffee bean blend. 100% Arabica coffee beans. Roast Date: Roasted fresh for you on the day you place your order. This coffee bean is delicious as both a black coffee or as a milk based coffee. Dark roasted Arabica coffee beans from South America, giving maximum crema, full of sweetness and body. Roast Date: Roasted fresh for you on the day you place your order. A delicious coffee bean, producing a thick strong crema with medium body. A coffee bean blend using a base of the super crema coffee bean of the Monsoon Malabar. Roast Date: Roasted fresh for you on the day you place your order. Wow, a full bodied complex six coffee bean blend. If you love flat white, cappuccino, latte or other milk based coffees, you will fall in love with this deliciously sweet coffee bean with chocolate bomb flavours. 100% Arabica coffee beans. Roast Date: Roasted fresh for you on the day you place your order. Coffee beans decaffeinated by the all natural Mountain Water process. This coffee bean is a full bodied quality Colombian coffee bean. 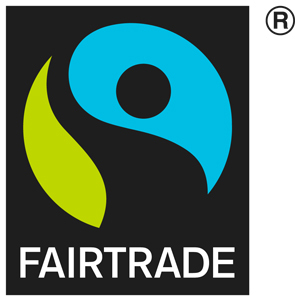 It's also Rainforest Alliance certified and Organic. 100% Arabica coffee beans. Roast Date: Roasted fresh for you on the day you place your order. Notes by James: Only a limited quantity of this bean available. Roast Date: Roasted fresh for you on the day you place your order. What a perfect idea. Each pack contains Bay Beans coffee beans; Mocha Prince, Espresso Master, Forte & Super Crema. Get yours today and share it with family and friends, or just keep it for yourself. Available as 1kg (4x250g), 2kg (4x500g) or 4kg (4x1kg) coffee beans packs. 100% Arabica coffee beans. Roast Date: Roasted fresh for you on the day you place your order. 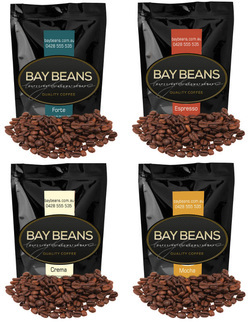 Save more on fresh roasted coffee beans by purchasing your coffee beans here, at the Bay Beans coffee subscription service. 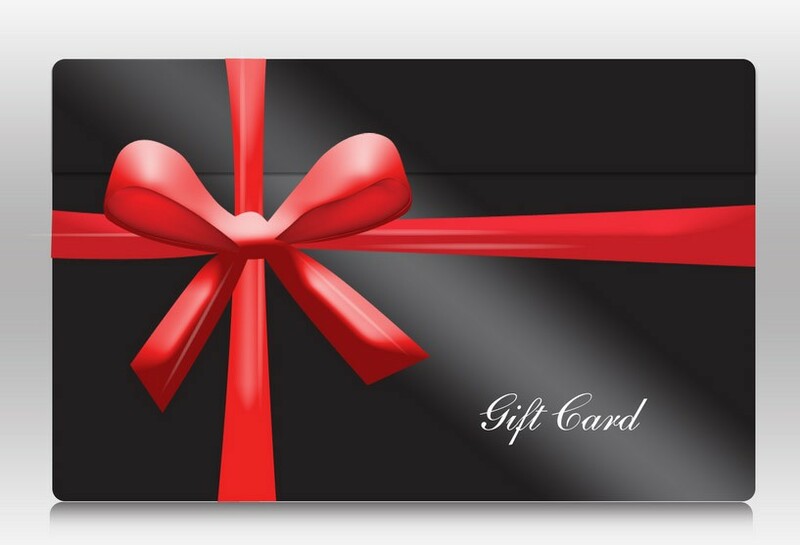 It is a great way to reward loyal customers with an on going discount. Your coffee beans aredelivered Free to your door, just like a magazine subscription. Based on your selection, receive 500g, 1kg, 2kg, 3kg or 5kg of Bay Beans coffee beans with each delivery. Coffees available in the coffee subscription service are Premium Reserve, Espresso Master, Forte, Super Crema, Mocha Prince as well as Fair Trade. If you prefer to try all our coffee's, choose Random Variety and we will send you a different coffee each delivery. Coffee club subscriptions are great for office, business, cafe and just perfect for home coffee machines. Roast Date: Roasted fresh for you on the day you place your order. A blend of comfort spices with the added richness of vanilla and the natural warmth and sweetness of honey. Bondi Chai Vanilla Honey Chai Latte is a seriously delicious, creamy-smooth blend of milk, black tea, honey, vanilla and exotic 'comfort' spices which tastes superb and is 'almost addictive' - usually served latte-style. Because it’s a powder, Bondi Chai is very versatile and easy to use and stores in its foil packs for at least 2 years. 'Chai' is the generic word for tea in many Asian and middle-east countries. In India it is a brewed, spiced, milky tea that was created for the Kings of India and has since become ‘India’s gift to the world’! Bay Beans Chai Latte is a creamy blend of spices designed to make an instant and delicious Chai Latte. In response to demand for a larger pack size, this is now 5 times the size of our other chai at 1kg, enough chai for commercial catering or, if your like me, just enough for home! It simple to prepare too, just add a table spoon to a small amount of hot water to dissolve the powder into a paste, then top it off with milk and steam with your espresso machine milk wand, or pop it in the microwave. Bay Beans Chai Latte is delicious anytime of the day. Packaged in a resealable zip lock bag and will keep good for 24 months. Bondi Chai Club Cinnamon Chai Latte turns up the spice in this delicious blend with the exotic flavours of Star Anise and Cinnamon beautifully complemented by the clean, fresh after-taste of Ginger. If you like cinnamon, you'll love Club Cinnamon! I am James, owner of Bay Beans coffee. You can contact me directly anytime for advice, tips, questions or feedback. My direct line is 0428-555-535 or email james@baybeans.com.au. It's the personal touch and great customer service that makes Bay Beans online shopping experience unique". You can expect to receive a personal confirmation of your order within two hours directly from James, so you know your custom is valued. 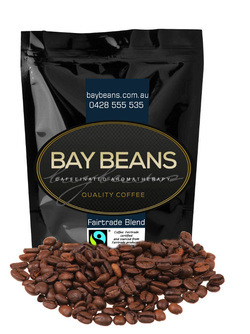 Buy fresh roasted Coffee Beans online at Bay Beans and save money with Free Delivery, anywhere in Australia. Your order is sent directly to James who then roasts your coffee beans fresh and arranges delivery to your door. 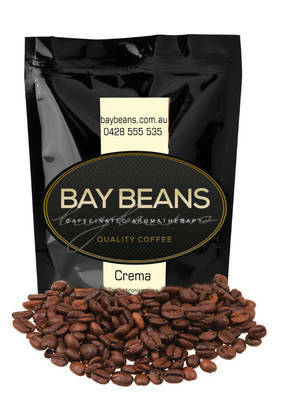 Bay Beans offers the most competitive coffee beans prices, with no hidden surprises at checkout. Delivery on all orders is free to anywhere in Australia.